The best thing about working a part time job from home is that when Friday rolls around, you might have only one hour left on the clock. You can read in bed until 10 am, feed the animals, and still be done working by noon. Oh, glorious day! After lunch, I dug about a third of the potatoes in preparation for the frost which keeps warning but never quite happening. Despite all of the good advice on uses for those potatoes, I'm going with an entirely different option --- I'm trading them to my co-worker for winesap apples out of his orchard. Before long, though, my brother Joey showed up with his big pickup truck to help us haul some gravel for the driveway. In the two years since we'd put gravel down last, some muddy spots had arisen, and gravel prices had also risen sharply. Still, a pickup truck load of gravel cost less than $20 and filled in three trouble areas. Mark went back to get a second load while I made us shitake-topped pizzas with homemade crust and homemade sauce (from tomatoes the neighbor traded us for two massive cushaws). Joey got to work stringing an ethernet cable and extension cord to his yurt four hundred odd feet away from the trailer in the woods. Crush and run (or crusher run) is commonly used on driveways. This is a mixture of different sizes, all pretty small. We opted for 2.5" rock, which is a better value for muddy, new driveway-type areas. You get less sinkage into the mud, meaning that you don't have to put down gravel as often. This might look odd on a city driveway. Finally, for those really wet spots and near the creek where gravel would just wash away at the first flood, we recommend rip-rap which is bigger gravel up to a foot or two in diameter (as seen in the picture.) You'll see rip-rap along the highway used for erosion control. It's going to be an exciting week --- we're learning to kill chickens tomorrow at a friends' house, and then when we get a chance we'll plant the fancy garlic that came in the mail today. 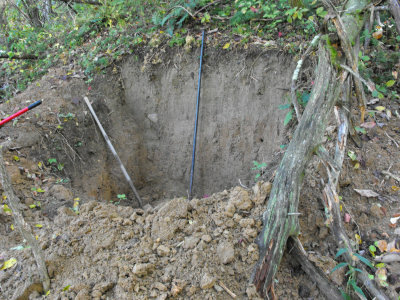 The picture above is another preview of coming attractions --- Mark and I have been poking at digging a spot into the hillside for a little root cellar whenever we had a spare minute for the last few weeks. We're nearly ready to start laying blocks!